Succulent, evergreen perennial plants set the stage for the popping hot pink flowers with yellow to white centers on this Ice Plant. 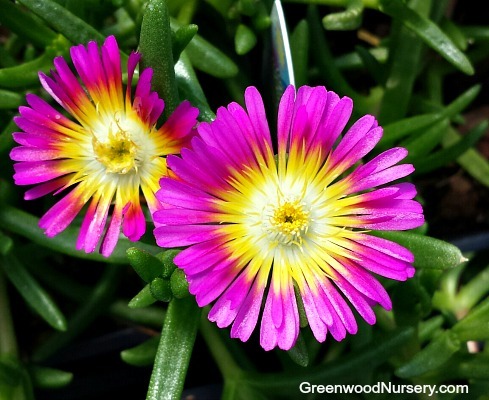 As with other delosperma, grow the Wheels of Wonder in well drained to dry soil. Butterflies are attracted to the pink flowers. Excellent choice perennial plant for rock gardens, containers, edging, retaining walls, desert gardens, courtyards and as a lawn substitute. Ice Plants are hardy succulent plants that will tolerate light foot traffic. Wheels of Wonder Hot Pink Ice Plant is grown in 3.5 inch pots. Orders shipping to AZ and CA will be bare rooted and root washed before being prepped for shipping.